The Delaware River Basin Streamflow Estimator Tool (DRB-SET) is a statistical model that uses historical streamflow information to estimate daily mean streamflow at any stream location within the Delaware River Basin. The ability to characterize baseline streamflow conditions, compare them with current conditions, and assess effects of human activities on streamflow is fundamental to water-management programs addressing water allocation, human-health issues, recreation needs, and establishment of ecological flow criteria. Daily mean baseline streamflow is estimated by equating streamflow expressed as a percentile from the flow-duration curve for a particular day at an ungaged stream location with the percentile from a flow-duration curve for the same day at a hydrologically similar gaged location where streamflow is measured. These estimates are then adjusted by water use found within the watershed. The estimated daily streamflows for the ungaged location can be exported to a text file that can be used as input into a statistical software package to determine additional streamflow statistics, such as low-flow frequencies or monthly flow-duration exceedance probabilities. The Delaware River Basin Commission and County Offices, including the Delaware County Soil and Water Conservation District, are using DRB-SET for water supply planning. Graphical representation of the QPPQ methodology, showing A, observed daily mean streamflow at a reference streamgage, B, flow-duration curve at the reference streamgage, C, constructed flow-duration curve at the ungaged stream location, and D, estimated daily mean streamflow at the ungaged stream location. Parameter-based regression equations were developed for 22 exceedance probabilities from the flow-duration curve for ungaged streams in the Delaware River Basin, relating streamflow to drainage size, soil characteristics, and precipitation. DRB-SET estimates baseline and altered daily mean streamflow for the period 1960-2010 for any stream location in the Delaware River Basin. This data can be used by water-resource managers and policy makers to address water allocation, human-health issues, recreation needs, and ecological flow criteria. 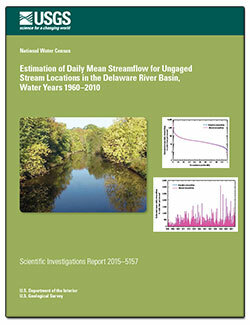 Stuckey, M.H., 2016, Estimation of daily mean streamflow for ungaged stream locations in the Delaware River Basin, water years 1960–2010: U.S. Geological Survey Scientific Investigations Report 2015–5157, 42 p., http://dx.doi.org/10.3133/sir20155157. 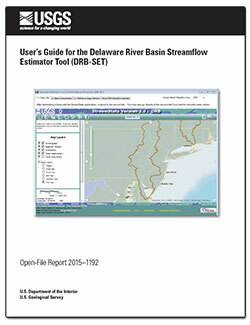 Stuckey, Marla H.; Ulrich, James E.
Stuckey, M.H., and Ulrich, J.E., 2016, User’s Guide for the Delaware River Basin Streamflow Estimator Tool (DRB-SET): U.S. Geological Survey Open-File Report 2015–1192, 6 p., http://dx.doi.org/10.3133/ofr20151192.